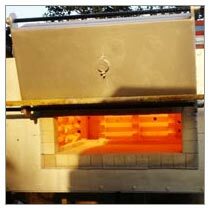 Our company is a distinguished Manufacturer, Supplier and Exporter of Hardening Furnace from Mumbai, Maharashtra. Our Hardening Furnace is fabricated using quality materials and under strict quality monitoring to ensure creation of a durable product. Hardening Furnace is used for heating steel and alloys for improving their mechanical properties to bring out a more hardened product. Our furnaces are in great demand in various industries because of their quick and efficient working. Customers can get in contact with us for quick bulk delivery of Hardening Furnace all over the world.